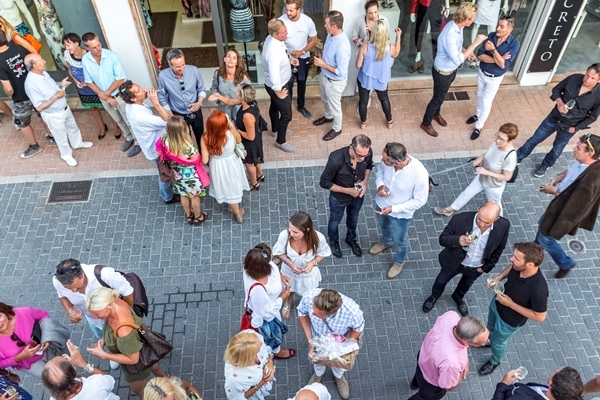 On Friday the 26th of May the new Porta Mallorquina team in Puerto de Andratx officially presented their new business premises on Calle Isaac Peral, 28 and invited customers, friends and neighbours to a glass of cava, Mallorcan wine and tapas as well as other typical island specialties. Around 100 invited guests turned up for the event, including Porta Mallorquina founder and CEO Joachim Semrau. At times there were so many people that it was quite crowded in front of the new office with its white facade and its large, welcoming windows. The new premises in the pedestrian zone are housed in a very modern duplex which even has a small roof terrace. With beautiful weather and tables laid in white the guests were entertained with live music accompanied by a glass of cool sparkling wine or Son Bordils local island wine together with tasty culinary treats until well into the evening hours. But that was certainly not all – in collaboration with Galeria K the guests were presented with an exclusive Vernissage by the internationally successful artists Esther Miranda and Dieter Nusbaum under the motto “Art meets Property”. Markus Schreurs and Karl-Georg Hermann have taken over the Andratx region as new managing directors and franchise partners. Both have long and extensive real estate experience and have successful real estate companies in their home town of Krefeld, and Markus Schreurs is also a co-founder of the parent company Porta Mondial AG. The two business partners are currently commuting between Mallorca and Germany. The office is headed by Andrea Keppler, and newcomers and real estate consultants Steffen Hoier and Thorge Takenberg have recently joined the team. A total of six languages are spoken in the Puerto de Andratx office: German, English, Spanish, Italian, Danish and Swedish.